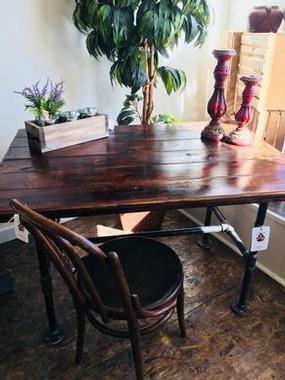 The sun is shining through our windows on this fabulous rustic industrial desk/table that we’ve just brought in. A solid piece designed and built by a couple of talented local guys. Measures 47.5” wide x 33” deep x 30” high. Pair it up with some high back leather chairs for dining or open up the laptop and you’ve got a unique beautiful desk. Love it! This look fits into the modern home - a country farmhouse - a city loft. Custom sizes can be built to your requirements.